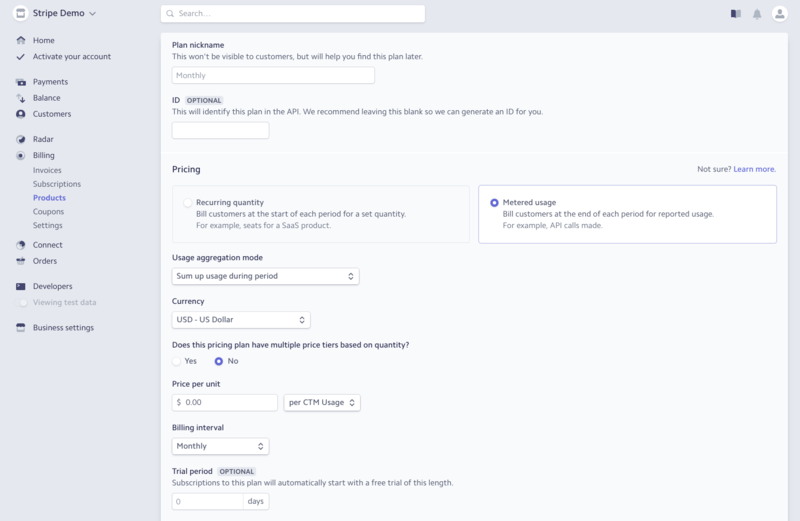 Stripe allows you to charge your customers directly for usage at marked up rates. Your agency credit card will be charged for all usage through your agency’s shared balance. Customer usage is sent to the Stripe plan the customer is linked to, and Stripe will charge the customer according to the markups you have applied. The Agency Dashboard will include revenue and cost figures to keep track of usage. The Stripe integration also allows you to securely accept payments over the phone using a payments button in your call log. Payment information is never stored on CallTrackingMetrics; the customer will be charged by Stripe. See below for more details. The Stripe integration is only available for agency plans. 1) Navigate to Settings → Integrations → Stripe. 2) Click Connect with Stripe. 3) You will be redirected to a Stripe page. From here you can create a new Stripe account and authorize access to CallTrackingMetrics, or you can sign in to your existing account first. 4) Click Authorize access to this account. 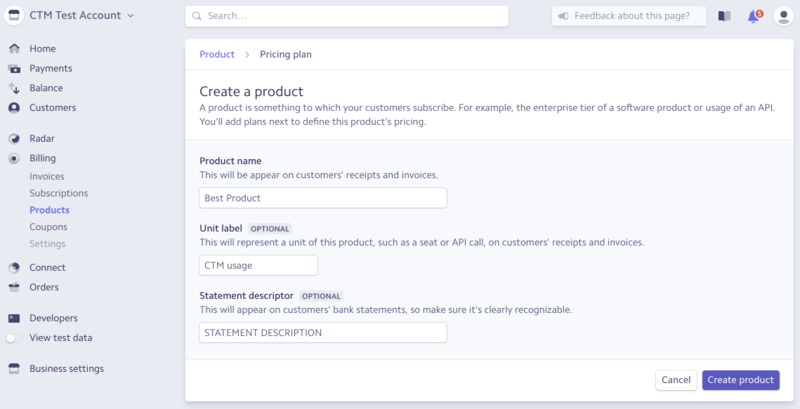 You must create a product in your Stripe account that will be associated with your customer’s subscription. The pricing plan linked to the product will determine how to charge for the product. 1) In Stripe, click Billing and then Products in the left hand navigation. 2) Click +New to add a new product. 3) Enter a product name, unit label (optional), and statement descriptor (optional). 5) You will be prompted to create a pricing plan for your new product. Enter in your plan information and select Metered usage. Leave “Price per unit” set to 0. Note on billing interval: the interval you choose determines how often the customer is charged for their usage. If you choose monthly, they will be charged once per month for the previous month’s usage. 6) Click Add pricing plan. You will need to create a customer profile in Stripe so that Stripe will have your customer’s payment information. This is the payment method that will be charged when the customer’s CTM usage is sent to Stripe. 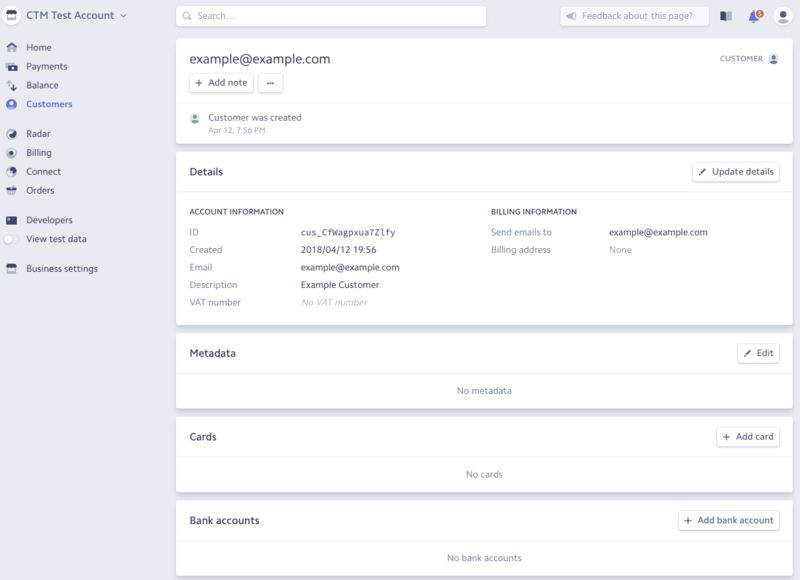 Each subaccount that you want to charge with Stripe will need their own customer profile in Stripe. 1) In Stripe, click Customers in the left hand navigation. 2) Click + New to add a new customer. 3) Enter in the customer’s email address and description. 5) This customer will now appear in your customers list. Click the customer’s email address in the list to view their details. 6) Here you will need to add a payment method for the customer. Click + Add card or + Add bank account to create a payment method. 7) Enter the payment details, then click Add card or Add bank account to save. Now that you have created both a product (with pricing plan) and a customer, you will create a subscription to link the customer you want to bill and the pricing plan you want them to have. 1) In Stripe, click Billing and then Subscriptions in the left hand navigation. 2) Click + New to create a plan. 3) Click + Select a customer and select the name of the customer you wish to add to this subscription. 4) Click + Add a product and select the name of the product/pricing plan you wish to use for this subscription. 5) Complete any additional settings you wish to use and set your billing method. Price markups are used to tell Stripe how much to charge the customer. 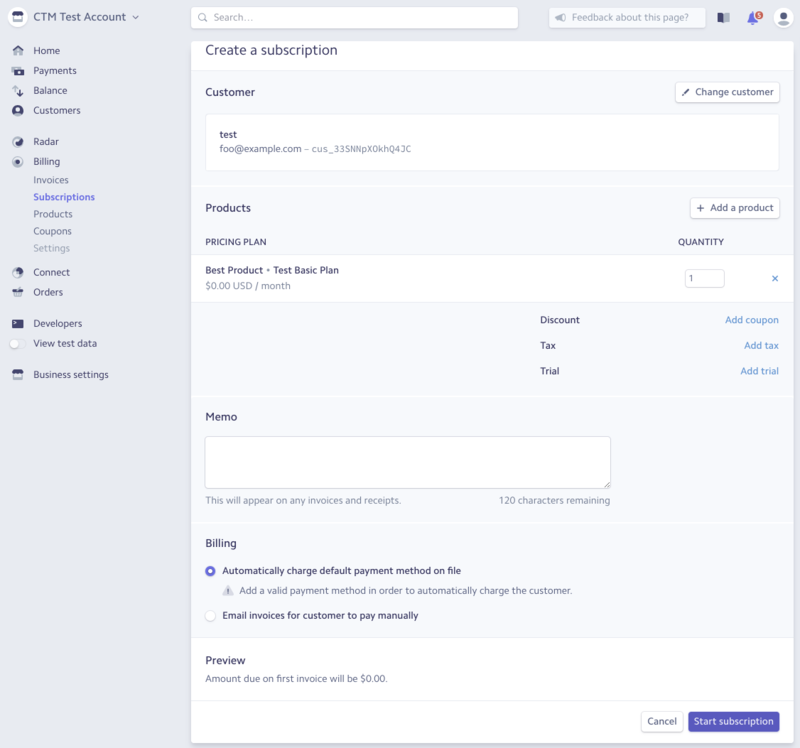 In order for the Stripe integration to work, the subaccount you want to use with Stripe billing will need to be set to use agency shared billing in CTM. 1) Navigate to Settings → Price Markups. 2) Click New Price Markup in the upper right corner. 3) Enter in your preferred markup settings. Click here for more information on creating markups. 4) In the Billing Plan drop-down menu, select Usage-based Stripe billing. 5) In the Associate to Stripe Plan drop-down that appears, select the name of the plan you created in Stripe. 7) Navigate to Settings → Accounts. 8) Find the subaccount in the list that you wish to move to Stripe billing. 9) In the Billing column, click the pencil icon to edit the subaccount’s billing type. The subaccount must be using agency shared billing in order for Stripe to work. 10) Click Assign price markup… to go to the Apply Price Markup page. 11) Use the Price schedule drop-down to select the markup you want to use for this customer. 13) Click Apply Price Markup. After the Stripe integration has been activated, an option will appear in the integration settings allowing you to enable a Stripe payment button in your call log. The payment button will open a pop-up window that will prompt you for the customer’s payment information, payment amount, and description of the charge. Payment information is never stored on CallTrackingMetrics and is instead securely handled by your connected Stripe account, and the Stripe transaction ID will be imported into your call log for your reference. If you are recording phone calls, all recordings will be stopped while the payment information window is open (recording will resume when the window is closed). 2) Scroll to the bottom of the page to locate the Accept Payments In Call Log section. 4) Complete the optional fields. You may choose to set a default charge amount. This may be useful if you charge the same amount for all services, or if you would like to use the amount for your highest-selling product. You may choose to set a default charge description. 5) Click Update to save your changes. 1) Click the payment button on the far right side of the call log (this will be found in the Actions column). 2) In the pop-up that appears, enter the required customer information, payment amount, and payment description. All call recording will stop while this window is open. Recording will resume when the window is closed. 3) Click Submit Payment. A conversion amount will automatically be set in the Score column of the call log, and the Stripe transaction ID will be attached to the call.